What Did You Eat Yesterday? is about two regular middle-age guys with regular jobs -- one's a lawyer and the other's a hairdresser -- doing all the usual, repetitious grown-up things, like balancing the household budget and making supper. Ohhhh, the suppers! There's a new supper in every chapter and they are just utterly crave-worthy. Every step is lovingly illustrated and described in great detail -- so much so that you could use the manga as a cookbook. Each chapter also ends with a "proper" typeset recipe or cooking tip, just to drive home the culinary nature of What Did You Eat Yesterday?. 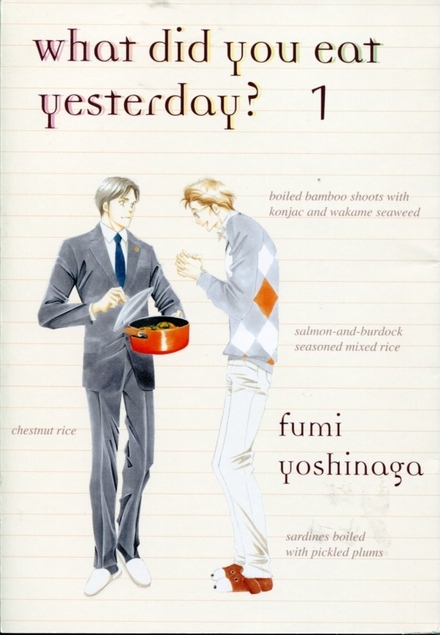 Rather like with Yoshinaga's Antique Bakery the food isn't merely window dressing but serves as kind-of a framing story around which the characters spin the daily stories of their lives. While it's not clear how long Shiro and Kenji have been together -- possibly three years -- they seem to have the relaxed, easy relationship that suggest long-term partnership. There's a lot of intimacy between them, but there doesn't seem to be a lot of romance left. Or, to put it bluntly, there are no shenanigans in Volume 1. Not even a smoocheroo. I can see where some readers might find What Did You Eat Yesterday? a bit boring -- as it's real slice-of-life stuff -- but that's what makes me love it. I've read very little manga about middle-aged people doing real life things, so was thoroughly charmed by What Did You Eat Yesterday? and have already added the next two volumes to my Amazon cart. 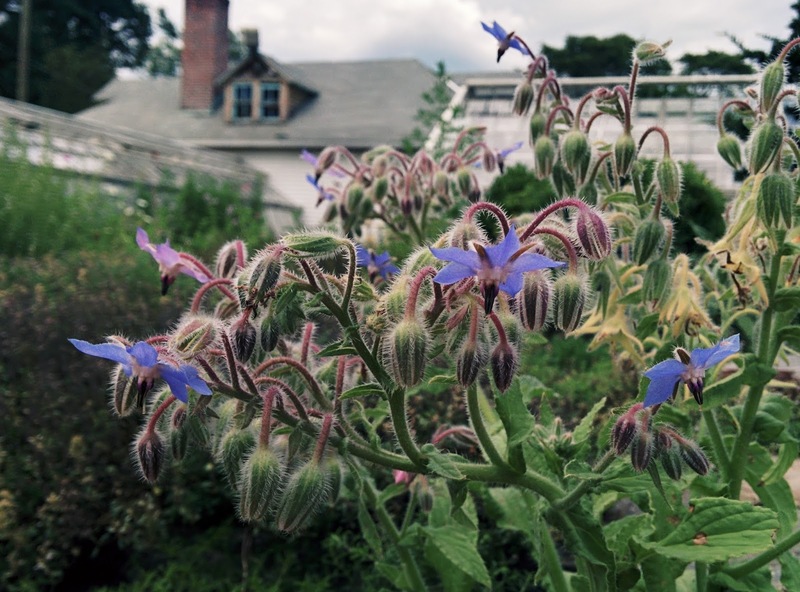 Borage in bloom. Love the hairy buds and the way the flowers face downward as if they're shy of the sun. One of my coworkers is getting married soon so we threw a little do for her one afternoon and it was really sweet. Her colors are pink and orange, so there was pink and orange everything. Plates. Napkins. Balloons. Pom-poms. Fans. Cupcake picks. Cookie decos. Look at that gooey caramel center! Rolos, yo. 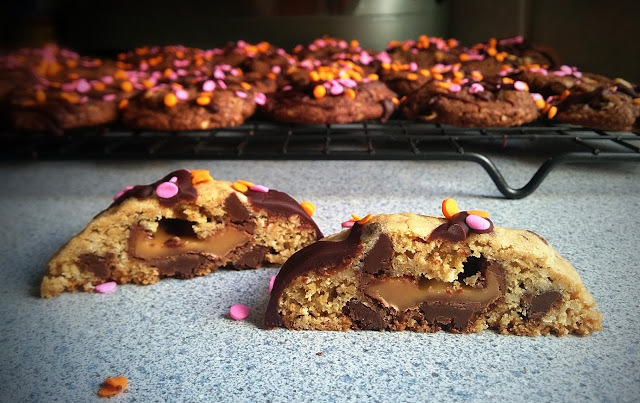 Yes, even the cookies were pink and orange! 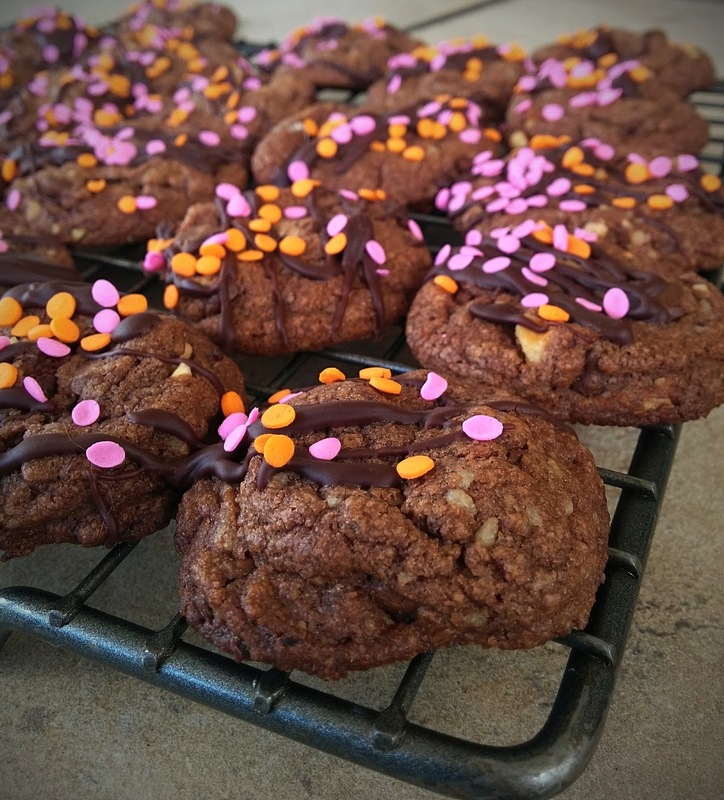 I used two Betty Crocker chocolaty cookie-mix based recipes -- "Chocolate-Caramel Filled Cookies" and "Chocolate Hazelnut Cookies" -- as the bride-to-be loves chocolate. As you can see by following the links, neither of my cookies looked much like Betty Crocker's! But they were both quite delicious and my coworkers nommed them up as if the cookies were manna in the wilderness. (The Husband was also rather disgruntled about the lack of cookies flowing in his direction ... I made dozens of cookies. Surely they didn't all need to go to work? Well, yes, they did). I made the cookies exactly as directed ... except I had so much glaze leftover from decorating the "Chocolate-Caramel Filled Cookies" that I used the excess to decorate the Chocolate Hazelnut Cookies," too. The white chocolate glaze might have looked prettier against the dark chocolate cookie, but I didn't know what else to do with the leftover glaze. Throwing it out just seemed silly. A term used to describe a style of modern fiction in which the recognizably realistic mingles with the unexpected and inexplicable, and in which elements of dream, fairy story, or mythology combine with the everyday, often in a mosaic or kaleidoscopic pattern of refraction and recurrence. Ahhh, tomatoes and herbs for August's Improv Challenge. What could be more fitting? My garden tomatoes are coming right along and my herbs are prolific, to say the least. In creating this month's recipe I tried to keep it as simple as possible to let the tomatoes and herbs really shine through. (Also, I had a lot of tomatoes ripen all at once and Something Had To Be Done). You will note my "recipe" provides no specific amounts for any of the ingredients. This is because it is all simply a matter of preference and pan size. I used a broiler pan which fit about eight diced plum and globe tomatoes. Lots of garlic and thyme, because I love them. A bit less oregano, because I find a little goes a long way. I used Wave Hill Bread's caramelized garlic bread to make my toast as it has whole roasted garlic cloves baked right in and is just DELICIOUS. If you can't find something similar at your bakery, any crusty loaf will do. 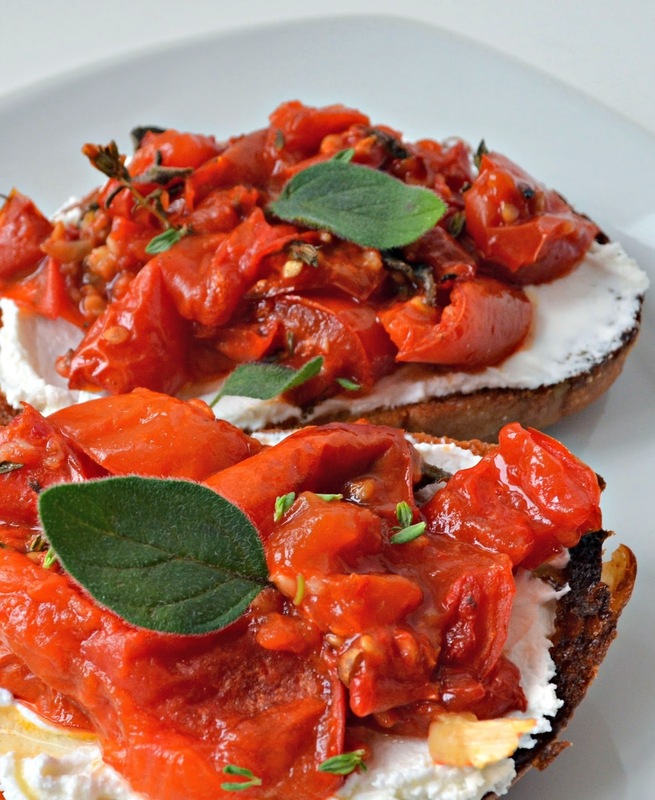 Gently toss together the chopped tomatoes, fresh oregano, thyme, and pressed garlic in a shallow baking pan. Drizzle with olive oil and sprinkle with salt and pepper. Roast until the tomatoes are soft and oozy, about 2 hours. Remove pan from the oven. Use immediately or refrigerate until ready to use. (If using later, warm before spreading on toast). Broil bread for 5 minutes or until golden brown. 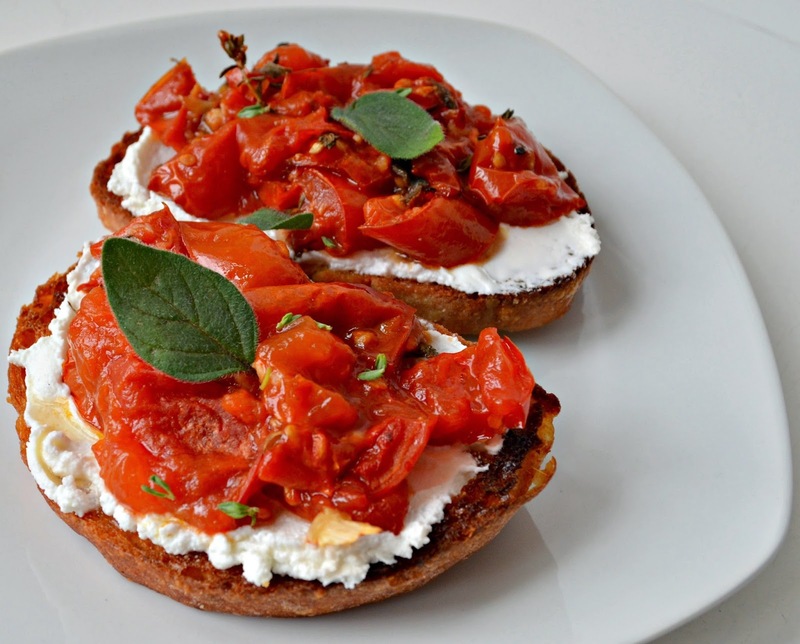 Remove bread from oven, spread each slice with goat cheese, top with tomato goo, and garnish with additional herbs. If you plan to serve these as an appetizer, just use slices from a thin, narrow loaf like a ficelle. The Wave Hill loaf I used is suitable for sandwiches and I find two creamy tomato toasts served like an open-face sandwich with a small salad or bowl of soup makes for a thoroughly satisfying lunch ... although, to be fair, I've also just ripped chunks of bread off the loaf and used them to scoop the tomatoes up straight from the pan into my mouth. It's best with the cheese, but sometimes I can't wait for the sweet, herby tomatoes to get in my belly. This week's Top Ten Tuesday topic -- authors we automatically buy, no questions asked -- was surprisingly difficult for me. Turns out there aren't that many authors I blindly buy, regardless of what their new book may be. I guess I'm just getting picky in my old age? I love my favorite authors, but that love isn't blind or unquestioning. CJ Cherryh, for example. I've loved her works since I was 11, for pete's sake, and have read so very many of them but I stopped buying them when I realized the Foreigner series was Never. Going. To. End. There are sixteen books (so far) in the series! It's too much for me. That's about it, really. 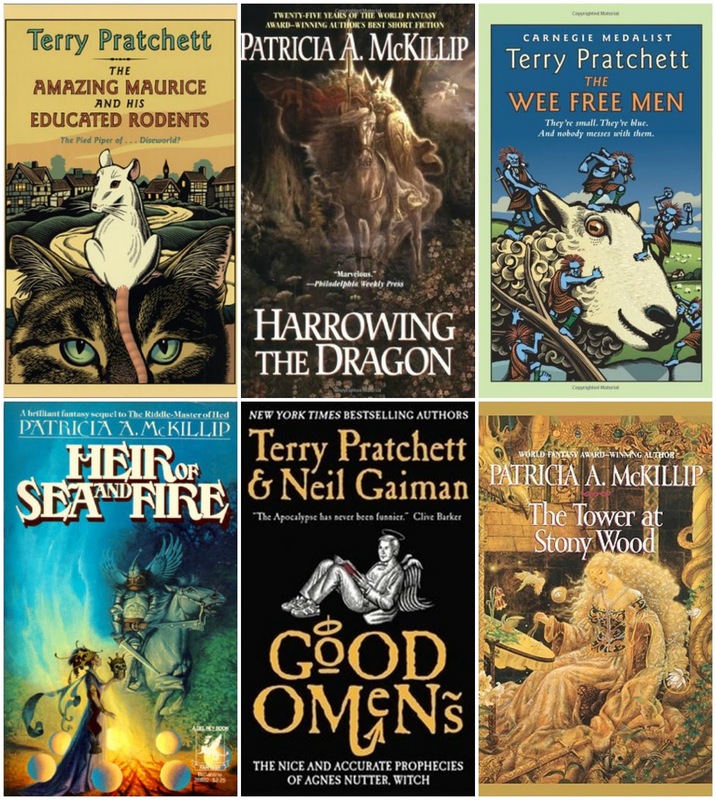 And, yes, I know Terry Pratchett's Discworld is umpty-umpth books long, but there's enough variation that it's not gotten to be too much. We've been in Rochester this week for work (The Husband) and leisure (me). 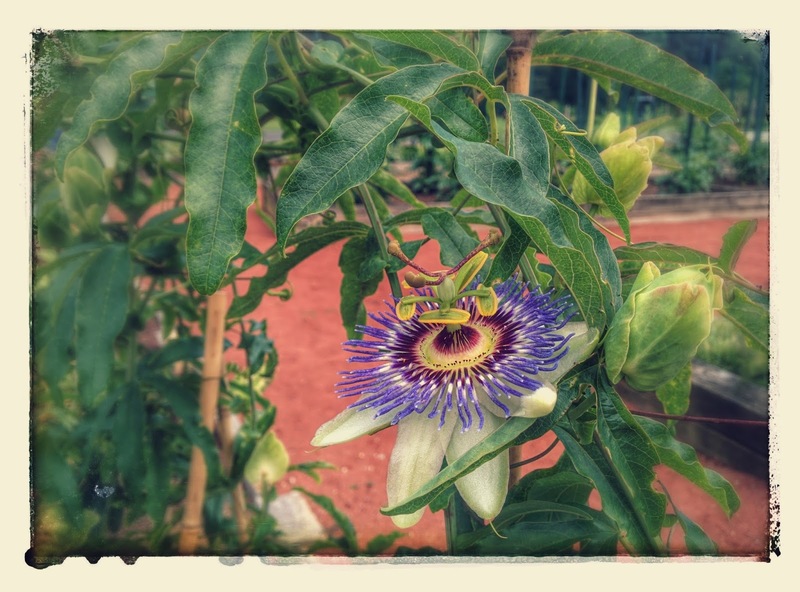 I definitely got the better deal what with all the nice green spaces, delicious foods, and fun museums I've enjoyed. To keep the Husband from getting too jealous, I've arranged little after work excursions, one of which took us to Hammergirl Anime. From the outside, sandwiched as it is between a storefront church and an Indian restaurant in yet another strip mall, the store doesn't look like much. But inside ... oh, inside! 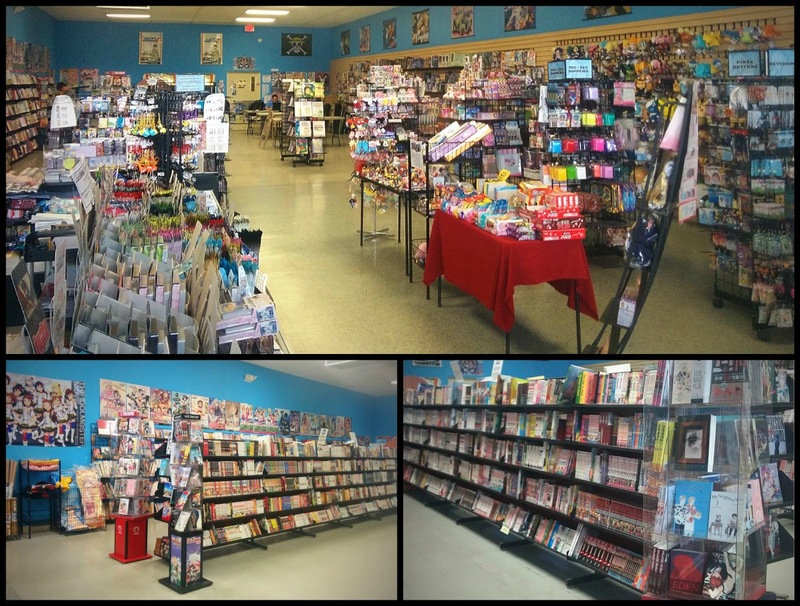 It is a manga-lovin' girl's paradise. Many of the comic book shops I visit have a token manga shelf or two, but (other than at The Comix Zone in North Syracuse, New York) I've never seen so much manga in one place before. Seriously, so much manga. So. Many. Kinds. And so much anime! And so much related merch with which to decorate your person or home. It was reallyreallyREALLY hard not to just hand over my wallet at the door and ask for one of everything. I tried to be "good" and picked up only the first volumes of a bunch of new to me series like What Did You Eat Yesterday? (gays + cooking = AWESOMESAUCE), Lizzie Newton: Victorian Mysteries ("a spot of Jane Austen with a dash of Agatha Christie") and Milkyway Hitchhiking (about a cat who travels through time and space). I also bought the standalone Awkward by Svetlana Chmakova, she of the fantastic Dramacon and Nightschool. The Husband bought an individually-wrapped Japanese cheesecake, which was soft as cotton and just melted in our mouths. Yummm. 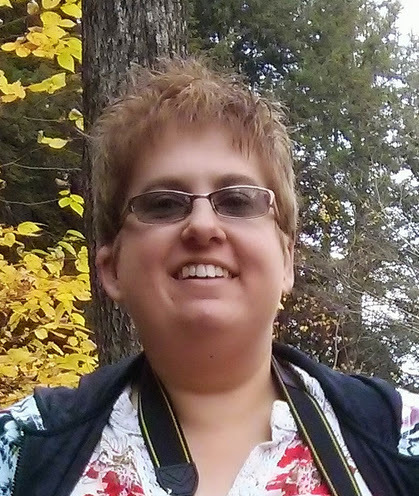 I can really only hope The Husband has a conference in Rochester next year, too! 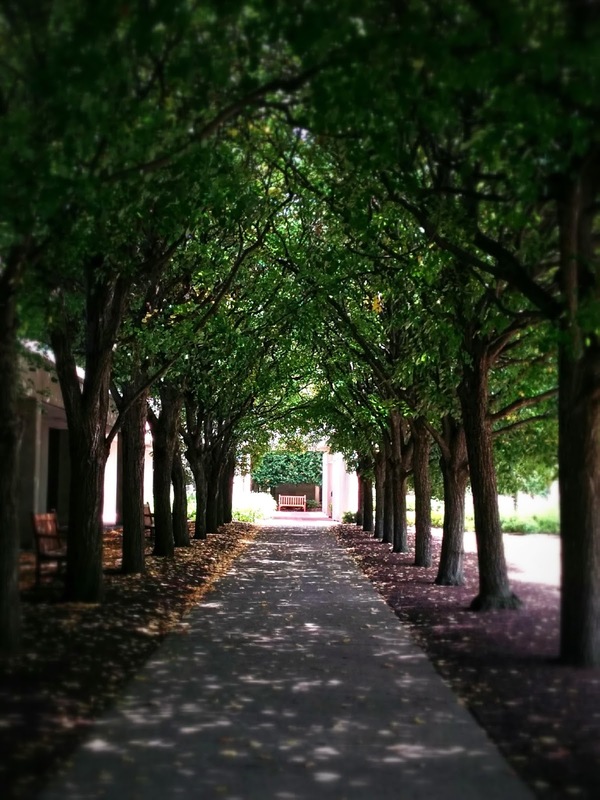 Sun-dappled shade. Memorial Art Gallery, Rochester, New York. Back in July of 2014, we did a Top Ten Tuesday on authors we own the most and now we're doing authors we've read the most! I expected more overlap than I actually ended up with. Much of this probably has to do with the sheer numbers of books I read as a money-poor-but-library-card-rich student. Also, there are authors I read so ... indiscriminately ... that it's just "smarter" to borrow their books from the library (Meg Cabot is a prime example). Otherwise, I'd even less shelf space than I already do. 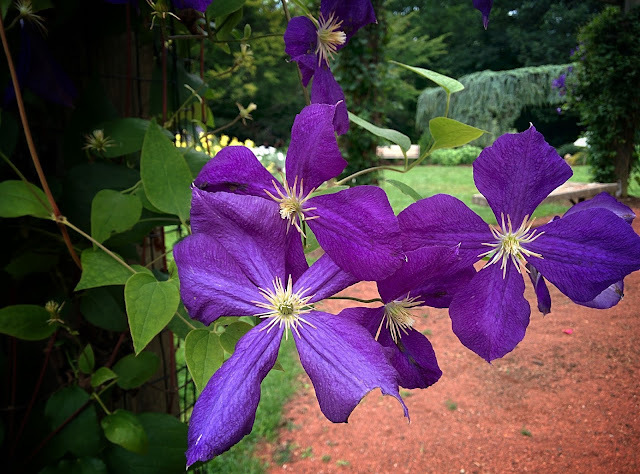 Clematis 'Jackmanii‍' twines 'round a pavilion post. Yes, it's another crustless egg bake. I'm really tempted to call them crustless quiches, but as there's no milk or cream in them, I'm not sure I can get away with that. Regardless, these crustless egg bakes or whatever you want to call them are quite tasty and forgiving -- I've yet to try a combination of ingredients that didn't turn out pleasing. 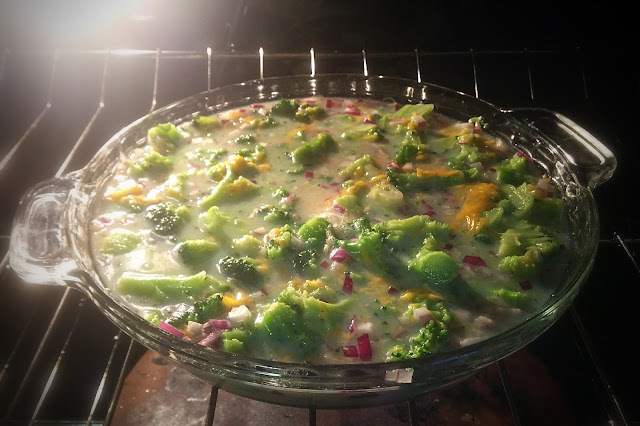 For this version, I stuck with the traditional broccoli and cheese. Considered adding chopped ham, but there wasn't really enough room in the pie plate! Less broccoli next time? So I can get some ham in? And sun-dried tomatoes? Mmm. In the oven, getting baked. Lightly coat a glass pie plate with olive oil or cooking spray. Pour into the pie plate. Bake at 375°F for 35-45 minutes or until eggs are set. 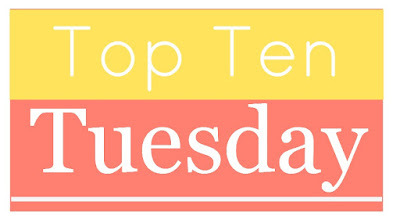 This week's Top Ten Tuesday is all about our favorite retold fairytales. Unsurprisingly, there's a lot of Robin McKinley on my list. What can I say? I love both of her retellings of Beauty and the Beast and her retelling of Sleeping Beauty is also pretty darn good!